Are there any honest attorneys out there? Not in Hollywood there aren’t (both on-screen and off). Well surely there have to be one or two that have a soul, right? 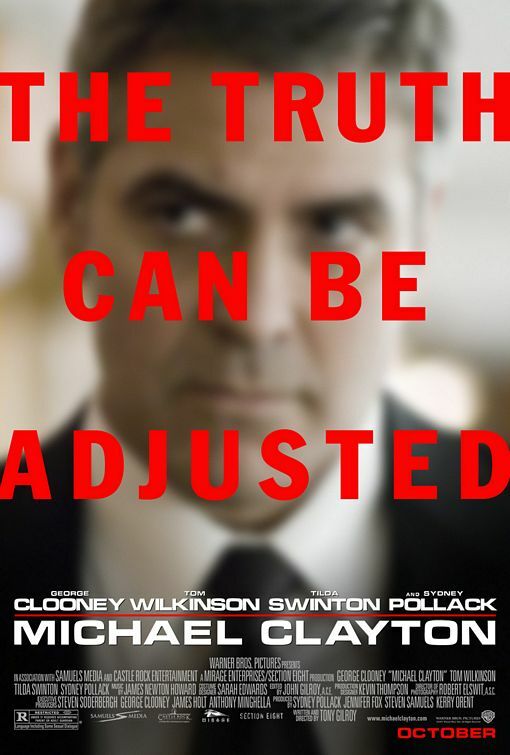 In Michael Clayton where “The truth can be adjusted” and frequently is, we find out that it’s not always as easy as that sounds. George Clooney is Michael Clayton, the “fixer” for a big-time law-firm with high profile and high-paying clients. If “fixer” does not provide enough information to know exactly what he does, don’t feel alone. All we are told is that he is a janitor, not in the literal sense, but still cleaning up the proverbial puke on the floor of the firm and it’s clients. But how do we know how much he actually does? This role starts and ends with his realization that he has not led an impactful or meaningful enough life. He was a criminal prosecutor yet chose to be a clean-up man for a big-time firm. Does he do illegal things? Does he just do immoral things? We will never know because the writers do not delve into what he has done in his past to cause this stark realization. I strongly feel this is the major component keeping this film from the upper echelon. Clayton’s janitorial duties take him to reigning in the mentally-ill Arthur Edens (Tom Wilkinson) who also happens to be one of the top litigators in the firm. The biggest problem there is that after six-years of defending the firm’s most profitable client in a chemical contamination lawsuit, he realizes how his soul has disappeared in the process. His agenda is to bring the truth out about the pesticide company and shed the lies and propaganda to bring justice to all those harmed. Standing in Edens’ way is Karen Crowder, the newly appointed Chief Counsel for the embattled pesticide company. Her one and only concern is to make this multi-billion dollar class-action lawsuit being defended by Clayton and Edens’ firm go bye-bye. As a meek and newly appointed executive trying to prove her worth, she is willing to sell her soul to make this suit disappear. Yet when she decides to have Edens and Clayton “taken out” for their attempt to come clean about the case by revealing the smoking-gun document (isn’t it great when there is one of those!) which fingers the company for ignoring the problem, she goes a little over the edge of believability. Even the Enron fools, who bankrupted thousands of families and swindled their way to a brand new level of corporate malfeasance, didn’t attempt to have anyone whacked Sopranos-style. Well, as far as we know anyway. I’m all for some of the Oscar nominations this film received, but not all of them. As I mentioned, Tilda Swinton did a nice job in this film but by no stretch was it an Academy Award winning performance. Mr. Clooney did an excellent job portraying the vulnerability and depth needed in the main character. Maybe it is the lack of expectations we have come to express when he graces the screen, but he certainly put in some of the better work of his career. I can see the Best Actor nomination but rightfully not a win. The biggest nomination I have an issue with was for Best Picture. I felt that this movie was an exciting, entertaining thriller that took a unique perspective on your standard law-firm-conflict movie, but it wasn’t one of the best. Charlie Wilson’s War, American Gangster (review coming next week), even Gone Baby Gone could have received that nod in its place. It is a movie worth seeing and one you will enjoy, I guess I expected a little more from a Best Picture nominee. More character development of Clayton and his role within the firm would have been a good place to start. One more crucial scene that left me scratching my head appeared in an important turning point toward the end of the film. We find out that Clayton had some weird affinity for horses that conveniently popped up in a ride home. Otherwise the end would have been a little bit sooner and certainly more unexpected. Although I’m sure the horses and open field were some kind of symbolism that only those quacks in the nerds club could figure out. Maybe the horses were Clayton’s free spirit beckoning him to run wild with them, maybe it was the creations themselves as part of the farms his client’s product helped destroy, whatever you want to call it, The Movie Mind still thinks the best description is “convenient”. So ignore a few details and you will thoroughly enjoy this movie. Nitpick about it as Best Picture nominee and you will see The Movie Mind sitting at your side of the table. Arthur Edens: I am Shiva, the god of death. Michael Clayton: You’re my meal ticket, Marty. If you leave, it’s just me and Barry in a room and I’m trying to explain what the hell it is I do around here. Michael Clayton: I am not the enemy. Arthur Edens: Then who are you? Michael Clayton: There’s no play here. There’s no angle. There’s no champagne room. I’m not a miracle worker, I’m a janitor. The math on this is simple. The smaller the mess the easier it is for me to clean up. Karen Crowder: This is a three billion dollar class action lawsuit. In the morning, I have to call my board. I have to tell them that the architect of our defense was arrested for running naked in the street. What sickness is he talking about? Cool intro to the review. This was a great film in my opinion. Second best of the year, after No Country. The end is classic when Clooney tells Swinton that she is so fucked and she falls to her knees. I love reading your movie descriptions! They are to the point, with some sarcastic undertones, and just enough BIG words to keep me wondering….what does malfeasance mean?? haha…great website!